Single door; nylon retainer. Used by many manufacturers. Includes four no. 8 x 3/4" Phillips pan head sheet metal screws. Universal design, zinc plated steel. Mounts to back of lead doors to maintain tight closure in openings not entered from both sides. Includes set of 1-1/8"H aligners and four No.8 x 3/4" Phillips pan head sheet metal screws. Stamped steel bracket mounts into top or bottom track; fits on "Slimfold" and others. Stainable and paintable, for use on hollow core or solid wood bi-fold door panels. 1-3/4"D x 1"H. Includes installation screws. Fits Acme 2900 Series bi-fold doors. Steel bracket mounts into top track. 1-15/16"L x 3/4"W overall. 1-1/4 inch x 2 inch, universal bi-fold door aligner, yellow zinc plated finish. Used by many wardrobe door manufacturers. 3/8"OD x 1"H nylon base and 1/4"OD pin with 5/16"H tip and 5/8"H from base to tip. Replaces bottom pivot/jamb bracket pivot used on tap in type hardware. Fits doors of many wardrobe manufacturers. Adjustable steel pivot with 1-3/8"H nylon base and 15/32"OD grooved tip sized for use with specified jamb brackets. Used by many wardrobe door manufacturers. Solid-nylon guide and pivot. 3/8"OD x 1"H base and 3/8"OD x 5/8"H guide tip. Fits doors of many wardrobe manufacturers. Adjustable steel pivot with 1-3/8"H nylon base and 15/32"OD grooved tip sized for use with specified jamb brackets. Fits on Acme doors. Adjustable stamped steel bracket and self-lubricating nylon bushing. 2-15/16"L x 15/16"D x 1-3/16"H overall. For 1" to 1-3/8" thick folding doors up to 50 lbs. each. Includes 2 No.8 x 3/4" Phillips pan head screws and 1 No.8 x 1-1/4" Phillips flat head screw. For steel frame bi-folding doors. 1/4"OD spring-loaded steel rod with 3/8"OD x 5/16"H white nylon guide cap, 5-5/8"H overall. Used on bi-folding shutter doors. Allows for non-mortise installation. 7/8"W x 1"H each hinge piece, 2"H overall. Includes 2 hinges and 8 flat head installation screws. Fits on Cox doors for horizontal adjustments. Adjustable stamped steel bracket and nylon bushing. 2-7/8"L x 7/8"D x 1-5/16"H overall. For 1" to 1-3/8" thick folding doors up to 50 lbs. each. Includes 2 No.8 x 3/4" Phillips pan head screws and 1 No.8 x 1-1/4" Phillips flat head screw. 1/4"W nylon wheel on spring-loaded steel shaft with plastic housing that tapers to 3/8" OD to allow for hammering into drilled hole. Self-adjusts from 1-1/2" to 2"H. Used by many wardrobe manufacturers. Self-adjusting 5/16"W nylon wheel with 3/8"OD x 1"H nylon base. 2-3/32"H maximum. Used by many wardrobe door manufacturers. 3/8"OD x 1"H nylon base and 19/32"OD x 7/16"H nylon cap. 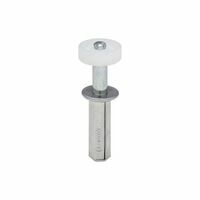 Spring-loaded, self-adjusts from 1-7/16"H to 2-1/16"H. National Hardware Folding Door Top Roller, Series: V391GR, Suitable For Use With: Door Frames, Steel, Plastic, Zinc Plated, BHMA A138.18 Fits Alliance doors and others. 5/16"H square nylon guide tip with 3/32"W slot (7/16" inside slot), 1/4"OD pin, and 3/8"OD x 1"H nylon base. Self-adjusts to a minimum 1-7/16"H overall. Fits Cox doors, 1" to 1-3/8" thick, bi-folding doors up to 30 lbs. each; nylon base. Used by many wardrobe door manufacturers. 1-7/16"H cut out allows for non-mortise installation. 1"W x 3"H overall. Includes 4 flat head installation screws. Fits Acme and Cox doors. Spring-loaded 1/4"OD pin, 7/16"OD x 1-1/2"H steel base, and 3/8"OD x 1/2"H nylon guide cap. For 1" to 1-3/8" thick bi-fold doors up to 50 lbs. each. Includes optional guide cap. 3/8" and 7/16" post diameter. Replacement top guide kit fits: Johnson Hardware, Acme, Alliance, Cox, National, Sterling, E-Z Roll. Used by many door manufacturers. Adjustable stamped steel bracket. 2-15/16"L x 1"D x 1-1/4"H overall. Bottom pivot with 7/16" OD stem, nylon base and steel pin that has a 1/2"OD tip with 3/8"W groove. Includes bracket, bottom pivot and 3 installation screws. Fits on Johnson Hardware doors. Steel bracket with nylon bushing insert to accept pivot pin. 3-1/16"L x 1"W overall. Includes two No.8 x 1-1/4" Phillips pan head screws.